Vanderwende grew up just outside Philadelphia. Six years ago he was driving from Pennsylvania to Colorado to start graduate school when he saw his first major wind farm, along Interstate Highway 80 in Iowa. “There’s just corn and wind turbines for a large stretch,” he said. There are dozens of the turbines between Des Moines and Council Bluffs, some so close it seems like you could touch them. At night they’re a constellation of blinking red lights along the horizon. Each is hundreds of feet tall. 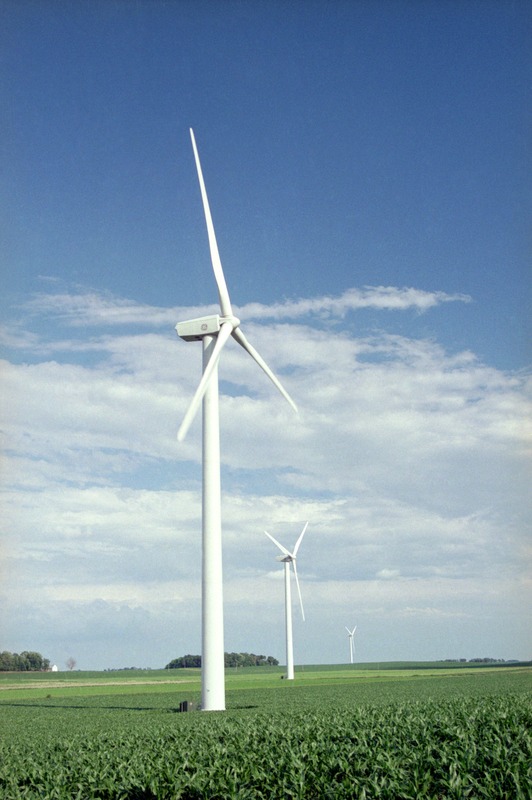 Lundquist, who also is a fellow at the Boulder-based National Renewable Energy Laboratory, collaborated with several Iowa State University researchers on the multiyear Crop Wind Energy Experiment (CWEX) (PDF). The team gathered measurements at a wind farm north of Ames to study how turbines affect factors that could influence crop growth, such as humidity and air temperatures. To tease out what’s happening, he and Lundquist used a computer model to calculate how corn and soybeans each affect wind speed 80 meters (262 feet) up, at the height of a typical wind turbine’s hub. Their hypothesis: Corn, at its mature height of 6-8 feet, imparts more drag on the wind than soybeans, which grow to 3 to 4 feet. Vanderwende and Lundquist used a version of the Weather Research and Forecasting model, a commonly used weather forecasting tool, to simulate an entire month’s wind speeds. To constrain the model “so it can’t go too far from reality,” Vanderwende said, they used CWEX data from August 2013. “We wanted to look at whether (the model) is generating the winds in a way it would be when crops are growing,” he adds. The CWEX data gives them that baseline. The model wind farm itself was laid out in an 11 by 11 grid, for a total of 121 turbines spread over 6.3 square kilometers (about 4 square miles). This realistic but simplified configuration helped make the model less computationally demanding. The researchers ran four versions of the model on a Los Alamos National Laboratory computer: two with a free stream – no wind turbines, but with ground cover of mature corn in one case and mature soybeans in another; and two with wind turbines, one with corn and one with soybeans. The researchers wanted to know how wind speed at hub altitude changes when switching from corn to soybeans, whether that change still exists when wind turbines are present, and what the effect is on power output. Their results are striking: Switching from corn to soybeans boosts the simulated wind speed by 3 percent at the 80-meter height of the turbine hubs. 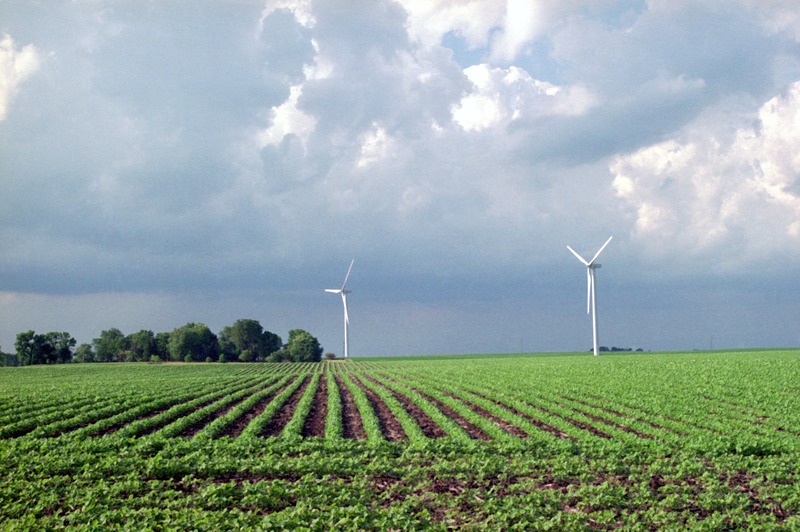 Soybeans, like these planted on a wind farm near Blairsburg, impart less aerodynamic roughness to the air layer near the ground. Credit: Todd Spink, National Renewable Energy Laboratory. That doesn’t sound like much change, but the increased wind speed translates to a 14 percent increase in power output. Based on electric rates of $30 to $60 per megawatt hour (MWh), the economic impact of going from corn to soybeans is between $133,000 and $266,000 total across the entire 121-turbine wind farm for the full month, the researchers estimated. For someone like me (and Charles Robinson) who doesn’t fully comprehend the physics, it seems surprising that the surface hundreds of feet below where the wind turbines turn could have that much effect on their performance. But in fact, those living near wind farms often are paid not to build things that would obstruct the wind. The effect is strongest during the day because of convection: The sun heats the earth, causing air to rise and pull turbulence with it. The drag effect subsides at night, when the sun isn’t out to make air rise. The model also showed the roughness effect on wind speed and turbulence declines rapidly with altitude, nearly disappearing at 500 meters (about 1,600 feet). That means wind turbine makers may want to build taller machines to minimize the effect of ground roughness. Here’s another obvious conclusion you could draw from the research: If switching from rough corn to smoother soybeans is good, switching to an even smoother surface – like grass, snow or even concrete – would benefit wind production even more. Vanderwende said he and Lundquist considered modeling a fallow field as well as corn and soybeans, but decided against it to best use their computer time. In theory, smaller crops like alfalfa or strawberries would help boost wind production, but as a practical matter, farmers aren’t going to give up growing Iowa’s two main crops without a major incentive. Include Robinson in that group. He wouldn’t consider changing his usual crops, he said, although one year he grew grass to help a research project measuring turbines’ impact on bird and bat populations. More research, bringing in agronomists and economists, is needed to address such questions, Vanderwende said. From his perspective, farmers and wind farm operators will need to collaborate, with some kind of combined economic incentive, if the goal is maximizing power generation. It’s also important to remember that the wind-power-cutting turbulence is strongest only when corn and soybeans are their tallest. At least until then, “I don’t think anybody should base any policy on this” new study, he added. Vanderwende also wants to increase the model’s fidelity. He and Lundquist are sure it’s fairly representative of a large wind farm’s physics, but it’s still simplified to make it computationally tractable. For instance, the model averages the effects of all 121 wind turbines rather than calculating each individually. The Colorado researchers want to model a smaller number of turbines at high resolution, then compare results with the simpler model. The more detailed model also would give the researchers more exact data on interactions between ground cover and wind speed. It’s something to think about in the coming year as you pass the thousands of turbines spread across the state.